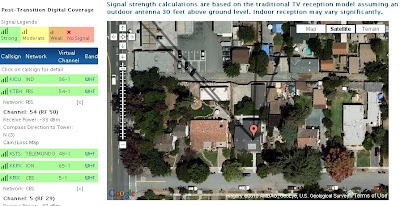 One of the first steps to setting up your TV antenna is to find out what TV broadcasters are in your area and where they are located. Turns out the good old FCC has made this super easy. Simply go to the FCC's DTV reception website. The frequency of the stations you care about (either VHF-Hi or UHF). When you click on the link above, enter your home address. Next go through the list of stations on the left, and click on each one that you are interested in. The stations are color coded (green being the closest) and sorted by their relative signal strength in your area. When you click on the station, you will see the left tab expand with station information and the location of the tower will show up on the map. You can click on all of the stations, but you will probably find that the towers are concentrated in a few areas. In my case, Sutro tower (all the way in San Francisco) is carrying most of my stations (more than 40 miles away!). This is why you may need a really good antenna! If you have stations on both UHF and VHF, you will need an antenna that performs well on both frequencies. Otherwise, you can use a UHF antenna by itself. 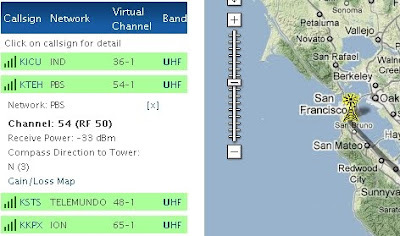 Now, to determine where to point your antennas, for each of the two bands (VHF/UHF), select all of the stations using the FCC website. You may find that some stations are in opposite directions and may have to choose which ones are important to you. Keep in mind that antennas have the best performance when pointed directly at the broadcast tower. Performance drops off slowly as you move the antenna away from the tower. When the antenna is 90 degrees away, you will almost certainly have terrible reception (if you get the station at all). Antennas can receive stations from the rear, but they usually don't perform as well. So, try to pick a direction that is roughly in the middle of the stations on the map. Now, you are probably asking yourself will I need a compass? No, there is an easier way! Select the stations that you are working with and click on the "Satellite" view of the map above. Then zoom in to the house level on the map. You should then be able to see the lines to the broadcast tower relative to your house! Just pick out a reasonably obvious landmark that you can see when installing your antenna. Once you have both antennas pointed in approximately the right direction, you may need to tweak the positions left or right depending upon your reception. You can use your TV/DVR/Computer to scan the channels. Remember that with Digital TV anything beyond about 60% signal strength is good enough to get a perfect picture most of the time. Just position the antenna until your worst station (that you care about) is at least this strong. 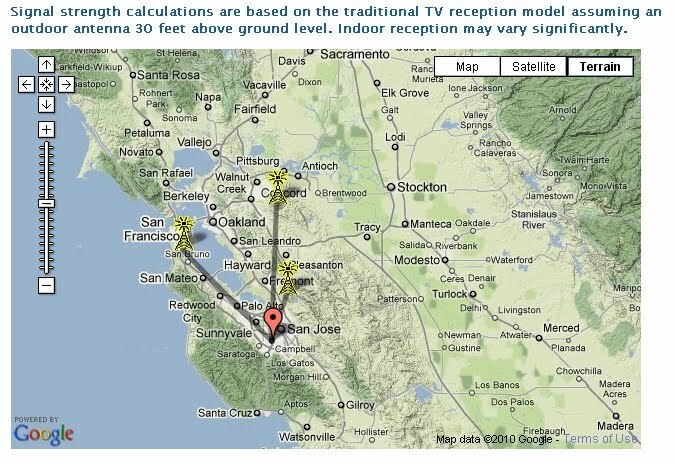 If you are unfamiliar with how new digital TV stations work, check out this brief intro. You may find that there are local stations that aren't listed in the FCC channel map about. For example, I get some extra channels on channel 1. Also, on good days, I can even pick up the PBS channel 22 all the way from Santa Rosa (greater than 80 miles away)! 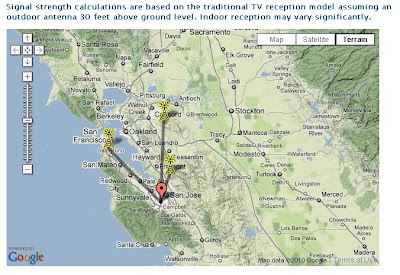 I found a really nice resource for my info regarding my local stations, check out this link: Digital Stations within 100 miles of San Francisco. When you go to this page, you can click on the station call letter names and it will take you to the FCC info regarding that channel (antenna info, location, broadcast power, etc). You may have similar resources in your area. For more general digital TV information, check out the FCC's website on the transition. TVfool.com also has great signal analysis tool here.